We talk a lot about trying to improve our city and on of the most common things is about making things better for pedestrians. Invariably that tends to involve doing things that reduce or even remove the vast amount of priority that we have given to vehicles, particularly parking, through improvements like shared spaces and street upgrades. The latest upgrades to be announced were a few days ago for Dominion Rd. One thing that really frustrates me when we talk about street upgrades though is the reaction that comes from business owners to theses suggestions. Dominion Road Business Association chairman Chris Hammonds says at the moment buses have to merge back into traffic because the lanes are not continuous. He says the upgrade is good news for both bus passengers and motorists. Chris Hammonds says bus lanes that run 24 hours per day, seven days per week, would cripple business along the road. He says keeping the lanes only operating at peaks times will ensure customers are still able to park near the shops they want to go to. Vehicle volumes have dropped by over 30 percent. Vehicle speeds have reduced by more than 25 percent. A 65% increase in spending is a massive increase, especially in the current climate and is largely down there being more pedestrians. So the next question is how we get more people to Dominion Rd. The reality is that to get significantly more people to the area the only practical way to do so is by improving public transport which means not just upgrading the lanes for use in peak times but also by making public transport more attractive off peak as well. Having buses have to merge in and out of traffic only serves to make them slower than cars and therefore unattractive. That probably might be as much of an issue on some streets but Dominion Rd is perhaps the premier bus route in the city (aside from the busway) and it has a lot of buses. To get an idea of how many buses are expected to be travelling down there in the future during the day we can have a look at the draft RPTP. Thats 18 buses an hour in the peak and 12-14 buses and hour off peak so there is the potential for a lot more people to get to and through the area. Add to that likely school bus routes, private tour buses, motorcycles and bicycles and that lane is going to be fairly busy while also transporting a lot of people. Instead of fighting to destroy the bus lanes outside of the peak hours, perhaps these retailers instead should be pushing AT to introduce the proposed fare zones faster that would allow people to get off a bus, quickly do some shopping and get back on another bus without being penalised. That would help encourage more people to stop off and shop and what’s more it would do so without using up a single car park but its seems some of these retailers are going to have to be dragged into reality kicking and screaming. 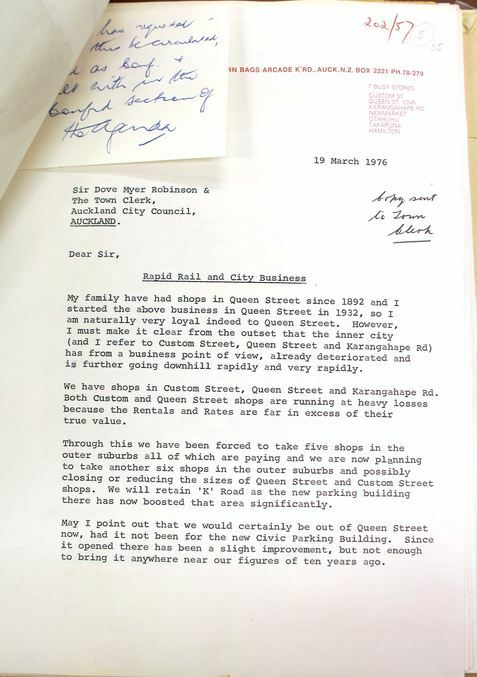 Interestingly on the topic of retailing and cars, Patrick found this letter from 1976 from a shop owner who when talking about the city centre notes that is being strangled with cars and that it will die without more people being able to easily access the city and he notes the only way for this to happen without adding more cars is by developing the mayor Robbies version of the CRL. ‘Let’s face the real issue- Either BRING THE PEOPLE INTO THE CITY WITHOUT CARS or LET THE CITY DIE’. This may seem counterintuitive to shopkeepers but there is a clear inverse corelation between car numbers in the central city and its vitality. And by ‘vitality’ he means commercial vitality; business. Only people buy things, and people will be in retail areas if they are good places to be and easy to get to. Sure some things are hard to take home without a car, but this can be dealt with either by offering delivery or by the fact that there is still a huge amount of parking around Dominion Rd. But the bigger issue for a traditional strip like Dominion Rd is the same as for the central city, retailers there have to offer something other than what is offered at the big malls, which is largely a bland and predictable experience of near identical chain stores with lots of parking. Dominion Rd has developed its own character and enhancing this is surely the best way to entice more and more of those people on those buses to hop off and spend some money there than to try to replicate the suburban mall experience. Being unmall-like is a key competitive advantage of Dominion Rd, and another is having an incredibly high- and rising- number of people on those buses just waiting to be enticed off and into the shops. Check those figures for the shared spaces in the city above and remember that not that long ago retailing in the CBD was consider all but over. Heaps of people get on and off the bus at Valley Rd shops with, wait for it, shopping bags. That is news to me that Hop punishes the short on/off trip. Unbelievable. Perfect method for AT to build relationships with shopkeepers. Could I suggest that we (I guess I mean CBT) write to the Dominion Road Business Association setting out your arguments? I am sure with all the people on this blog with such fantastic knowledge of the benefits and consequences of better PT, we could put forward a pretty persuasive letter. Perhaps we could offer to meet with them and discuss the proposals? I am a member of CBT (we met at a meeting a couple of months ago) and I would be happy to help. I am a lawyer and so have some skills at writing letters. Just a thought. We do tend to preach to choir and as satisfyting as that is, it would be great to get the message out. 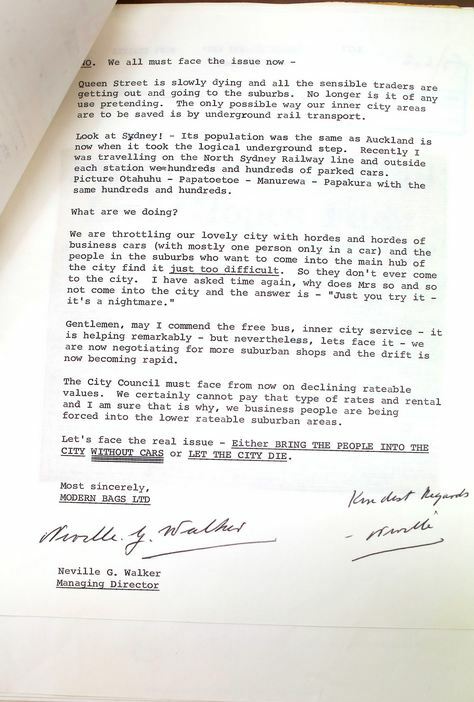 I’ve mentioned before a couple of studies undertaken 15-20 years ago in Newmarket and Highbury that both showed that people arriving by bus outspent people arriving by car by a reasonable margin, perhaps it’s time to revisit those studies on Dominion Road! hi. Yes, I wonder if it might even be worth calling the business owners association and asking if they would like you to speak to them? I’m sure it would be a “challenging” presentation but you might find it helped more than a letter. I personally would never drive to Dominion Road and expect to park there – instead I expect to park on one of the side streets and I always do find parking, even though I am often going either on a weekend or midday on a weekday. I lived in a house for two years where Dominon Rd was my local shopping area, back in the days were I drove everywhere for everything. I can’t recall ever once parking on Dominion Rd itself, always on the side streets or the Valley Rd carpark. This is one aspect of the cars in cities debate where I am completely in agrement with Matt and Patrick. Perhaps if eery shopkeeper read “Lots of Parking” and see how the acres of parking lots on abandoned skyscraper sites killed th foot traffic in downtown Detroit or read studies of the Old Pasadena Town reitalisation they might appreciate how their focus on free and confenint parking is actually economic suicide we might end up back with the thrifing community hubs that we had back in the days of borough councils. Oh come on I drive all the way from the Lower North Island, park on Dominion Road, half way down, just like the song says, buy an icecream, and then drive back. If you took away the parking where would I buy an icecream? LoL – somewhere in the lower north island would seem more convenient.